In the long war to convince the rest of the world that our taste rises above the level of provincial, we Texans have achieved one notable victory: Even our most grudging critics now concede that we have somehow acquired remarkably commendable taste in architecture. Several of the twentieth century’s most prominent architects built some of their very best buildings here, beginning with Louis Kahn’s Kimbell Art Museum, which was anointed an instant classic upon its completion, in 1972. Since then, a succession of not-to-be-missed landmarks by superstars like Philip Johnson, Renzo Piano, and Tadao Ando has transformed Texas into a destination for design cognoscenti. But this success story simply plays to the enduring prejudice that we are forever destined to remain mere importers of high art, deep-pocketed consumers with an eye for quality merchandise that we’re utterly incapable of creating ourselves. A closer look at Texas’s ten best buildings (according to me) offers a different narrative, a surprising saga of rebirth, revolution, and a long journey toward cultural self-determination. It begins back in the middle of the eighteenth century, when the Spanish brought Europe’s latest trends to the New World. Like the variegated bunch that followed them—Germans, Alsatians, Chicagoans, New Yorkers, Italians, Asians—these builders didn’t conquer Texas. Instead they were humbled by its daunting vastness, brutal heat, surrealistic light, and the epic collision of cultures and faiths that has always defined our state far more than any Anglo American template. The real story of Texas architecture is this: For centuries the Old World has come here to be born again, to evolve on our Darwinian frontier. Even the superstars reinvented themselves here; in Fort Worth, Kahn finally reached the apotheosis of his hugely influential career, while in Houston, Johnson and Piano made dramatic about-faces that quickly transformed cities all over the world. 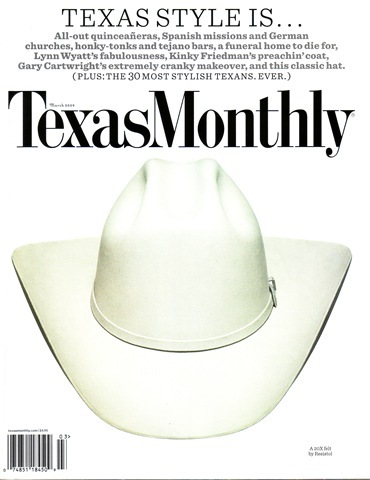 So from the ten buildings that follow we can begin to construct a liberating vision of what “Texas style” can and should be: neither a clumsy collection of homemade clichés—local color pursued ad nauseam—nor a sophisticated but slavish pursuit of international designer labels. The best Texas architecture has historically shown us the third way, arrived at via a centuries-long conversation between this land, its people, and a global culture from which we have borrowed much, yet to which we have richly contributed in return. 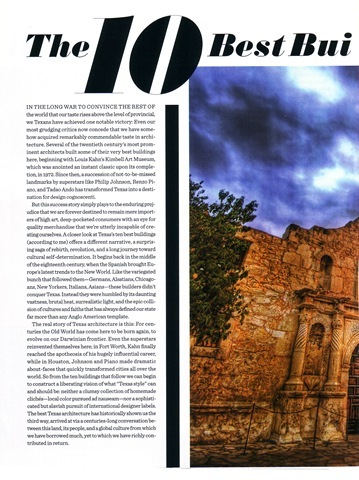 The oft-told tale of anglo-american ascendance in Texas usually begins at the Alamo in 1836, but this is also the site of a more venerable story that began some eighty years earlier. 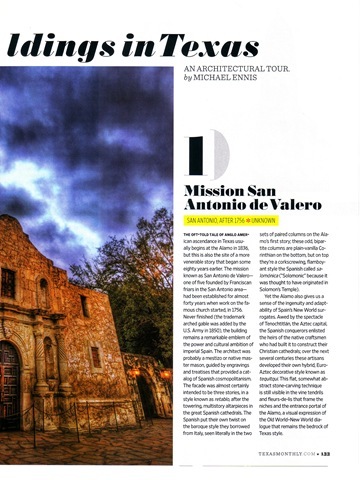 The mission known as San Antonio de Valero—one of five founded by Franciscan friars in the San Antonio area—had been established for almost forty years when work on the famous church started, in 1756. Never finished (the trademark arched gable was added by the U.S. Army in 1850), the building remains a remarkable emblem of the power and cultural ambition of imperial Spain. The architect was probably a mestizo or native master mason, guided by engravings and treatises that provided a catalog of Spanish cosmopolitanism. The facade was almost certainly intended to be three stories, in a style known as retablo, after the towering, multistory altarpieces in the great Spanish cathedrals. The Spanish put their own twist on the baroque style they borrowed from Italy, seen literally in the two sets of paired columns on the Alamo’s first story; these odd, bipartite columns are plain-vanilla Corinthian on the bottom, but on top they’re a corkscrewing, flamboyant style the Spanish called salomónica (“Solomonic” because it was thought to have originated in Solomon’s Temple). Yet the Alamo also gives us a sense of the ingenuity and adaptability of Spain’s New World surrogates. Awed by the spectacle of Tenochtitlán, the Aztec capital, the Spanish conquerors enlisted the heirs of the native craftsmen who had built it to construct their Christian cathedrals; over the next several centuries these artisans developed their own hybrid, Euro-Aztec decorative style known as tequitqui. This flat, somewhat astract stone-carving technique is still visible in the vine tendrils and fleurs-de-lis that frame the niches and the entrance portal of the Alamo, a visual expression of the Old World—New World dialogue that remains the bedrock of Texas style. Freed from Mexico, Texas became a slaveholding state (with little appreciation for the irony), and its booming cotton economy financed a taste for the Greek Revival style popular in the antebellum South. (Until the recent fire, our Governor’s Mansion, built in 1856, was a nearly pristine example of the genre.) But far more important to the evolution of a distinctly Texan architecture was the mid-century influx of thousands of German immigrants, many of them intellectuals and political dissidents. These hardscrabble newcomers took pride in the simple houses, barns, and churches they built with a combination of Old World techniques like fachwerk (walls crosshatched with timbers and filled in with stone, brick, clay, or plaster) and New World climate-control conventions such as the dogtrot, a broad passageway through the center of the house intended to channel cooling breezes. Fredericksburg’s Marienkirche raises this pragmatic German-Texan vernacular to its literal and aesthetic heights. 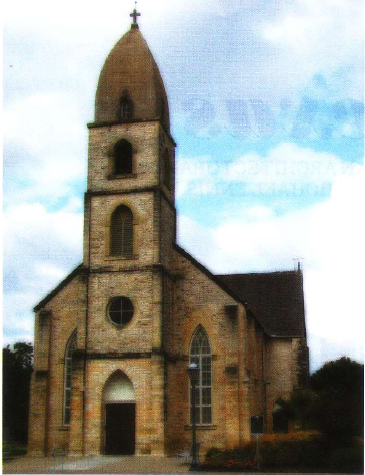 According to local lore, parishioners were exhorted to build the church by a Jesuit missionary named Francis Xavier Weninger, a celebrated motivational speaker who roamed the country preaching to German Catholics. Under the supervision of their priest, Father Peter Baunach, St. Mary’s parishioners designed and constructed the building themselves in about two and a half years, using the same local limestone and cypress they employed for their barns and homes. The unknown architect (or architects), who certainly was not a professional, nevertheless showed enormous intuitive skill in cramming all the basic features of a cruciform Catholic cathedral into a compact, reserved, almost minimalist package—along with demonstrating an independent streak in the atypical, convex-sided “helmet” steeple. The Marienkirche was ahead of a trend, as Gothic Revival churches sprouted in towns and cities all across nineteenth-century Texas. The fashion it helped start eventually caught up with this pioneer church, which was superceded in 1906 by the present St. Mary’s, a much more ornate building next door. The lancet windows were altered when the Marienkirche was converted to a schoolhouse but have since been restored to their finely tuned original proportions. Humble yet aspirational, practical but refined, the modest Marienkirche still stands as a model for an enlightened twenty-first-century Texas architecture. 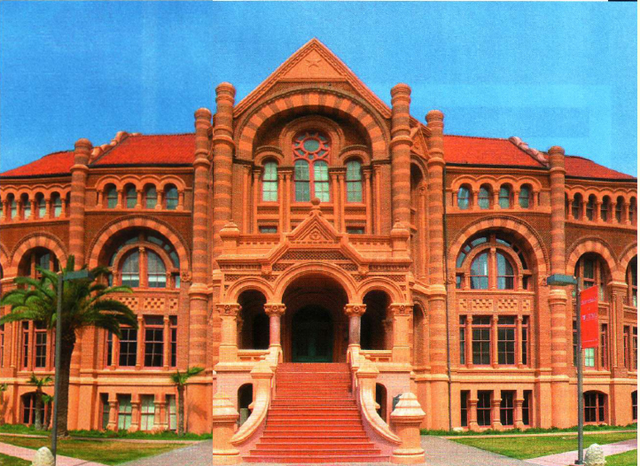 Texas’s first star architect was born in County Cork, Ireland, and spent most of his first thirty years in Cincinnati, where he worked as a plasterer, marble carver, and architectural draftsman before he settled down in Galveston, in 1872. Nicholas Joseph Clayton was a private man who didn’t marry until he was fifty and whose career never recovered from Galveston’s 1900 hurricane; when he died, in 1916, he hadn’t had a major commission for more than a decade, and his passing was barely mentioned in the local newspapers. Yet no architect had ever so single-handedly shaped the face of a Texas city. During the last quarter of the nineteenth century, when Galveston was arguably the most sophisticated metropolis in Texas, Clayton completed almost two hundred local commissions. Not shy about advertising himself as the “earliest established professional architect in the state,” Clayton found his calling at a time of unprecedented extravagance, when the railroads had not only sown prosperity all across the country but provided the newly affluent easy delivery of a cornucopia of luxury building materials. The same picturesque, ersatz styles—Gothic Revival, Renaissance Revival, even pseudo-Islamic—that were popularized in Europe and the East Coast quickly appeared in Texas. Clayton was accomplished at all the revival idioms; for the plum medical school commission, one of the most important of his prolific career, he chose the newly fashionable Romanesque Revival style but refined it in a way all his own. A master of decorative details (like the intricate Lone Star—motif capitals he drew for the elaborate entrance portico), he lightened up the building’s massive three-story arches with polychrome riffs in semitropical shades of red brick, sandstone, and granite, contrasted with a tile roof that was originally blue and green (now it’s a more timid terra-cotta). Yet what really distinguished the building was its classical structure. While Clayton’s peers believed that asymmetrical floor plans and facades added to the colorful character of their buildings, he preferred a scrupulous balance. Even the most elaborate parts don’t overwhelm the whole, and the underlying lucidity of the composition reveals a prescient modernity as much as it evokes the past. For the first three decades of the twentieth century, Henry Charles Trost’s signature on El Paso was as indelible as Nicholas Clayton’s stamp on Galveston. The Ohio-born son of German immigrants, Trost designed hundreds of buildings in his adopted city and was if anything a more wide-ranging eclectic than Clayton, essaying everything from Mission Revival to art deco to his strangely apt Bhutanese-style buildings for what is now the University of Texas at El Paso. Though Trost is rarely credited with breaking new ground, this relatively modest, beautifully preserved house in an El Paso suburb has a solid claim to being the cornerstone of the twentieth century in Texas architecture. Trost began his career as an itinerant architectural draftsman, spending most of the 1880’s plying his trade around the increasingly civilized West, in places like Dodge City, Denver, and Fort Worth. He resided most of the next decade in Chicago, where daringly spare, iron-framed skyscrapers and low-slung Prairie School homes marked the genesis of the modern era. Though Trost probably never came closer to the action than drawing details for high-rise innovator Louis H. Sullivan, he seems to have run in the same circles as Frank Lloyd Wright. 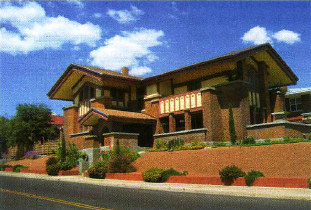 By 1903 Trost had moved to El Paso to join his brother Gustavus, also an architect. Their firm, Trost & Trost, flourished with a middle-of-the-road approach, giving clients the period styles most still demanded while paring away the decorative excesses. But Trost’s own residence, in scenic Sunset Heights (where he also built homes for a number of his clients), allowed him to put both feet fully in the future. Wright’s Prairie School was originally a Midwestern regional style, featuring rooflines almost as flat as the heartland horizon and unbounded interior spaces that seemed to spill out over the plains. In El Paso Trost adapted the Prairie School to what he called “arid America,” extending the eaves of the thick double roof (with an insulating layer of air in between) out like the wings of some early flying machine, ensuring that all the windows were almost continuously shaded from direct sun during the summer yet allowed sunlight to enter during the winter—a passive energy efficiency that was both timeless and a century ahead of its time. In one brilliant stroke Trost had introduced Texas to modernism, and to regionalism—the idea that Southwestern or Texan architecture should have a distinctive, well-defined character suited to our land, climate, and traditions. Reconciling these two seemingly contradictory visions has been the central dilemma of Texas architecture ever since. What henry trost didn’t achieve with an oeuvre of more than six hundred buildings—credit as the father of Southwestern architecture—David Reichard Williams earned, not undeservedly, in a career that lasted less than a decade and amounted to a handful of private homes. Born in a dugout on a West Texas ranch, Williams worked as a civil engineer in Mexico and traveled widely in Europe before setting up shop in Dallas, where his flamboyant, irrepressible personality quickly drewan influential circle of fellow artists, intellectuals, and bohemians to his legendary Pearl Street hangout, the Studio. Like David Williams, O’Neil Ford was a product of rural Texas, born on a Hill Country farm near a place called Pink Hill, but he had a considerably more farsighted view of Texas regionalism. By 1932, when he started his own firm, modernism had become a global phenomenon. Ford was deeply sympathetic to the movement; his problem was how to embrace it without leaving behind the lessons he and Williams had learned in the Texas Hill Country. 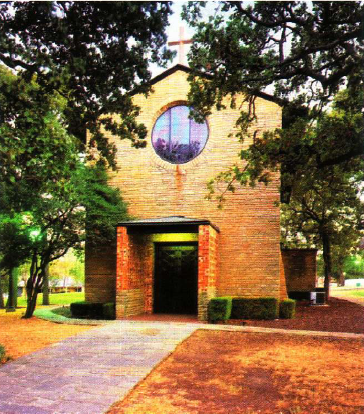 The small chapel Ford built with his sometime partner and longtime friend Arch Swank, on the pastoral campus of what was then the Texas State College for Women (now Texas Woman’s University), illustrates his elegant, subtle synthesis of past and future. Ford shared the modernist penchant for basic geometry, but instead of straight lines and sharp corners, here he used gentle, parabolic curves for the nave arches, a simple, repeated rhythm that nevertheless gives the constrained space a soaring quality. The construction process was remarkably similar to the community building project that raised the Marienkirche; financed by donations from students, faculty, and alumnae, the chapel was constructed by unskilled student labor (some of which was provided by the New Deal’s National Youth Administration). Ford used rough local fieldstone, which was more forgiving of the student masons, and the rusticated surface adds the natural warmth and texture that Ford often deployed to soften modernism’s hard edges. Louis Kahn’s Kimbell Art Museum inaugurated an era of brand-name imports. In 1966, when he was awarded the Kimbell commission, Kahn’s best-known buildings in this country were the Yale University Art Gallery and the visionary, cast-concrete Salk Institute, in California; internationally, he had assumed cult status with two immense, utopian projects, a graduate business school campus in India and a two-hundred-acre government center—a small city, really—in East Pakistan (now Bangladesh). Yet for all his ambition and critical acclaim, Kahn was a cipher, an enigmatic man whose obsessively secretive personal life was marked by multiple affairs and illegitimate children; he was equally opaque professionally, given to cryptic, self-important pronouncements while often seeming as confused as anyone as to where he was going with his incontestably brilliant, sui generis designs. Kahn’s good fortune was to be hired for the Kimbell job by a man who knew exactly what he wanted. Richard Brown, a Harvard-trained art historian and the Kimbell’s first director, had been vested with near-plenipotentiary powers by Velma Kimbell, the widow of Fort Worth businessman and benefactor Kay Kimbell. It was Brown who sent Kahn back to the drawing board when his first sketches showed a sprawling complex of vaults with towering V-shaped arches. Kahn returned with one of the most pure designs in the history of architecture, a sequence of sixteen relatively low-profile—only 24 feet high—cast-concrete barrel vaults, structures that were capable of spanning hundred-foot-long galleries unobstructed by load-bearing walls. The cycloid vaults were also integral to the natural-lighting scheme; they could be slotted to admit light into the galleries even in the interior of the building. 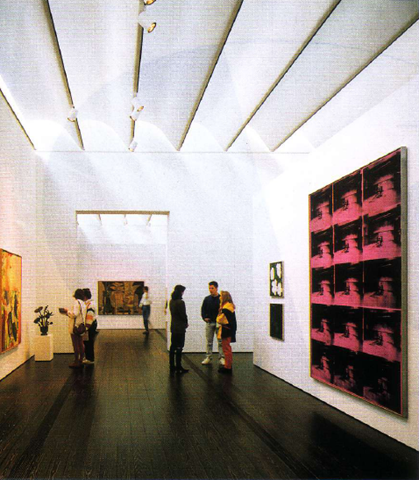 The problem was diffusing the harsh Texas sun; after considerable study, this was accomplished with narrow, finely perforated aluminum reflectors that ran the length of the slots, allowing some light to sprinkle softly into the galleries. The rest was reflected over the surface of the vaults, washing them with an ethereal, slippery silver glow, a transmutation of light into form that hushes even the most casual visitors. 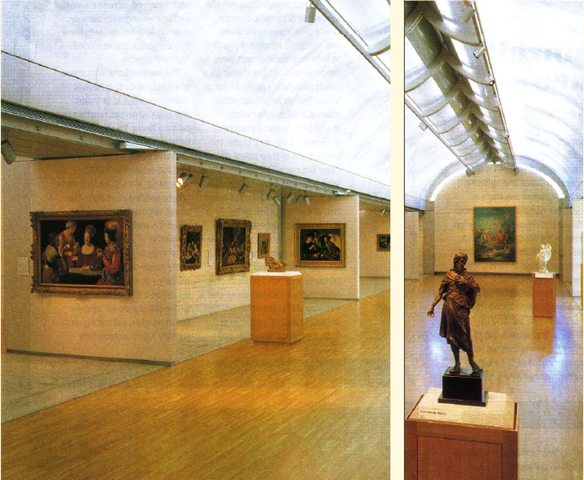 Kahn, who rarely credited his collaborators, confided to his daughter that when he sketched the Kimbell design, “another hand was doing the drawing.” In a local television interview, he elaborated that his mind was “full of Roman greatness,” acknowledging his debt to the ancient Romans’ use of the barrel vault for utilitarian structures like warehouses. Whatever the source of his inspiration, Kahn, who believed that “architecture must have the religion of light,” found a home for his wandering faith in his Fort Worth museum. Today the Kimbell, that modestly scaled, bare-concrete Taj Mahal of natural light, is widely regarded as not only the summit of Texas architecture but also one of the world’s most nearly perfect buildings. 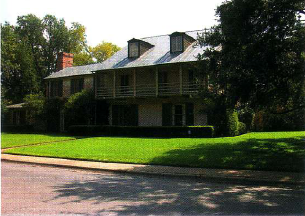 Philip Johnson’s love affair with Texas began in 1948, when he came to Houston to build a house for aspiring art collectors Jean and Dominique de Menil. Johnson’s reputation rested on his connections with modern masters like International style icon Ludwig Mies van der Rohe and on a glass house he was building for himself in Connecticut. Johnson did not take to Houston immediately: “I couldn’t understand how anyone lived there,” he recalled years later. But the city’s architectural community simply went gaga over the patrician, opinionated East Coast aesthete and his rarified theories. 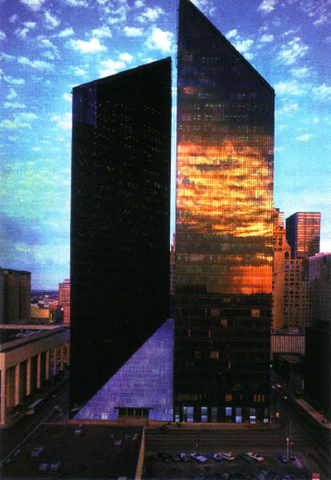 By the seventies, Johnson had completed half a dozen major projects in Texas and had long since discovered the allure of Houston’s wheeler-dealer milieu: “I found out those people weren’t afraid to try anything!” The risk taker behind Pennzoil Place was developer Gerald D. Hines, who was hatching an entirely new strategy for leasing office space, using brand-name architects to sell high-rise buildings in the same way a bankable star could fill a movie theater. Hines’s client, Pennzoil CEO J. Hugh Liedtke, wanted a new corporate headquarters that didn’t look like a cigar box, but his space requirements weren’t enough to fill up a downtown high-rise. So Hines brought in another major tenant, the Zapata Corporation, and told Johnson to come up with a design that expressed the split personality of the project. Johnson proposed two 36-story trapezoidal towers separated only by a ten-foot-wide slit where their angled faces abutted, creating a breathtakingly intimate pas de deux between the two massive structures. When the model was shown to Liedtke (whom Johnson, himself well over sixty years old when he designed Pennzoil Place, later described as a “cranky old individual”), the oilman loved the slit but was just furious about the flat cigar-box tops. The lobby that connected the twin towers was a pyramidal shape with a steeply pitched triangular roof, and Johnson, famously quick on his feet, plucked this piece from the base of the model and put it on top, as if he were playing with blocks. “That’s it,” said the suddenly mollified Liedtke. And that was the genesis of the most celebrated roofline in decades, two sheer trapezoidal tops angled at a 45-degree pitch. Pennzoil Place wasn’t technically postmodern—it now looks more like the precursor of the shape-shifting, minimalist-sculpture forms in vogue today. But it broke the box, and over the next decade Johnson’s art deco Transco Tower and Gothic RepublicBank Center, both borrowing unabashedly from history, gave Houston the planet’s first postmodern skyline. In his seventh decade, the former pied piper of the International style became the world’s most incendiary architect, leader of the revolution against the modernist ancien régime he had himself established. Piano seemed determined to play against type. His low-profile, boxy design was part International style, with a rectilinear framework of steel girders painted white, and part Gulf Coast vernacular: gray-stained cypress siding and dark pine flooring in the galleries, along with shaded porches and a dogtrot-like central hall running entirely through the building. The marquee feature, however, was the roof. The de Menils had hired Kahn to repeat his magic with natural light, and the same was expected from Piano. But where Kahn had hung reflectors beneath his vault slots almost like lighting fixtures, Piano used his reflectors as the actual roof of the entire building. Three hundred wavelike, ferro-cement louvers were hung from iron trusses, shading the museum galleries and porches like giant venetian blinds. The louvers were positioned so that some weak northern light came directly into the galleries, but the strongest sunlight was reflected from the top of one leaf to the bottom of the next. The effect was an even more naturalistic lighting scheme than Kahn’s. “People will be able to feel the day changing, the clouds coming over,” said Piano when he presented the idea. “Bland,” “monastic,” “determinedly unspectacular” were some of the terms critics applied to the building. But actual users quickly found it one of the world’s most blissfully sublime marriages of art and architecture. And although Piano himself described the Menil as “totally introverted,” it became the template for the rest of his career, as he continued to build site-sensitive, tasteful museums all over the world, employing increasingly sophisticated high-tech schemes to manage natural light. Perhaps even more important, at the height of postmodern enthusiasm and excess, the Menil Collection pointed the way toward a new generation of modernist buildings that could be both innovative and neighborly. Little more than a decade and a few miles from Pennzoil Place, this is where modernism began its comeback. Texas has produced at least two great buildings in this decade: Renzo Piano’s Nasher Sculpture Center, in Dallas, and Japanese architect Tadao Ando’s Modern Art Museum of Fort Worth. But sustainability is rapidly becoming to this century what functionalism was to the last. If modern buildings were “machines for living,” the best designs of this century will be machines that use far less energy and fewer resources. Before railroads and air-conditioning, sustainability was a necessary virtue for Texas builders. David Lake and Ted Flato are heirs to that regional tradition; both worked at O’Neil Ford’s San Antonio office before starting their own firm in 1984. Lake/Flato is nationally recognized for adapting the Texas vernacular—limestone walls, sheet-metal roofs, the functional geometry of barns and water tanks—to clean-lined houses that are unmistakably modern yet seem to grow out of the land. The World Birding Center is an ambitious ecotourism project started by Texas Parks and Wildlife, a series of nine bird-watching sites extending 120 miles along the Lower Rio Grande Valley. The headquarters and visitors center is a complex of three buildings clustered around a courtyard, a practical layout on South Texas farms and ranches for centuries. 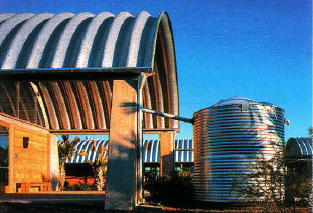 The arched, corrugated-steel roofs are self-supporting, using less steel than the usual trussed-metal roof; the utilitarian, Quonset hut—like design was based on local farm buildings, but it echoes classical models in much the same fashion as Kahn’s barrel-vaulted Kimbell Museum. The arches also shade walkways that function both as bird-watching venues and outdoor hallways, allowing the buildings to get by with less interior space. Among the sustainable features are eighteen rainwater-collecting tanks, while locally produced clay bricks and recycled cypress planking reprise traditional building materials. The World Birding Center completes a circle for Texas architecture, proving that looking back doesn’t preclude moving forward with creative panache. And there’s a lesson in this two-and-a-half-century round-trip for a culture still struggling to escape its self-invented stereotypes: Only when we embrace the future in all its complexity can we authentically revive our past.